▪ Malala Yousafzai is headed to Oxford University. 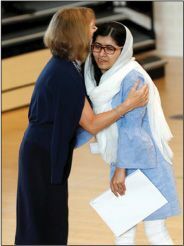 The Pakistani-born schoolgirl activist is known for her brave stance against the Taliban, who shot Yousafzai when she was 15 for campaigning for women’s right to an education. She survived, and her persistenhree “A” grades in her final exams. “So excited to go to Oxford! !” she tweeted, sharing a photo of her acceptance letter.